General Who Backed Surge Picked For Top Iraq Job Lt. Gen. Ray Odierno, a hulking and aggressive New Jersey native, has been picked to succeed the more cerebral and diplomatic David Petraeus as the top commander in Iraq this summer. Petraeus is being promoted to oversee the entire Middle East. Later this summer, there will be a new top American military leader in Baghdad. Lt. Gen. Ray Odierno will take over from his boss, Gen. David Petraeus, who is being promoted to a job overseeing the entire Middle East region. Just two months after the fall of Baghdad in 2003, Odierno, a hard-driving general from New Jersey, appeared before reporters. Odierno was a two-star general, commanding the 4th Infantry Division in what was called the Sunni Triangle, a restive area northwest of the capital. Odierno talked of his sweeping operations, and he brushed aside talk of the rising number of hit-and-run attacks and whether these were the start of guerrilla warfare. "This is not guerrilla warfare," Odierno snapped. "It's not close to guerilla warfare, because it's not coordinated, it's not organized, and it's not led. The soldiers that are conducting these operations don't even have the willpower. We find a majority of the time they'll fire a shot, they'll drop the weapon, and they'll give up right away." But it was guerrilla warfare, and it was growing fast. Gen. John Abizaid, then the top U.S. officer in the region, acknowledged it just a few weeks later. There were also charges, even among fellow generals, that Odierno was making the guerrilla warfare worse. "Odierno just didn't get it," says Juan Cole, a professor of Middle Eastern history at the University of Michigan. "He didn't understand what it means to win hearts and minds. He didn't understand local culture. ... He'd have his troops go through women's underwear in the house looking for arms." An Army report released just this week agrees, saying Odierno's combat operations swept up large numbers of Iraqi men, including those who were innocent of any wrongdoing, and leading to what it calls "disaffection" within the Sunni community. Brig. Gen. Joe Anderson later served as a chief of staff to Odierno. He says Odierno faced a tough enemy in the Sunni Triangle and also worked hard to rebuild the area. But, he adds, "I think admittedly he would tell you he went in a little stronger than he would have liked in '03." Now Odierno is poised to take over a less violent Iraq from Gen. Petraeus, a man credited with turning the country around and widely viewed as one of the Army's best. Odierno told senators in May that he is ready to pick up where Petraeus left off. "We are clearly headed in the right direction," Odierno said. "And I believe a self-reliant government of Iraq, one that is stable, one that is committed to governance and protecting its own people and serving all its people, a place that's denied as a safe haven for terrorists and extremists and integrated into the international community and a partner in the war on terror is absolutely possible in Iraq. And I think it's closer today than it has been." Odierno wouldn't agree to an interview because Senate approval of his nomination is pending. The general's supporters say he has learned a lot in the five years since barreling through the Sunni Triangle, such as the importance of counterinsurgency tactics, winning hearts and minds, and the art of diplomacy through a stint as an aide to Secretary of State Condoleezza Rice. The war has also taken a personal toll: His son, an Army officer, lost an arm when a rocket-propelled grenade slammed into his Humvee. "I think he learned a lot about the importance of counterinsurgency tactics and how they can be applied across the board," says retired Gen. Jack Keane, a strong supporter of Odierno. And Keane dismisses the comparisons between Petraeus — the Princeton Ph.D. — who would charm sheikhs and wrote the book on counterinsurgency, and "Big Ray" Odierno, the hulking armor officer from Rockaway, N.J. — a onetime football player. "They both have tremendous credentials," Keane says. "Their differences are in personality and style, which I think is insignificant." But some wonder whether Odierno has the right personal skills for the job. There are those who thought a better choice was Lt. Gen. Peter Chiarelli, a more congenial officer who served in Baghdad and focused more on reaching out to the locals. But Chiarelli became the Army's No. 2 officer in the Pentagon. Odierno may be facing a tougher job than Petraeus — there will be fewer U.S. troops, now that the so-called surge is over and the challenges are more political: getting Iraqi officials to govern better, hold elections, rebuild their country and reach accommodation among all sectarian groups. "Iraq has always been complex; now the complexities are different," says Lt. Col. Gian Gentile, who has written about the challenges in Iraq for Military Review, an Army publication. "The fundamental question is who will ultimately hold power in Iraq? Will it be Shiite or Sunni?" Odierno was an early proponent of the so-called surge in forces, saying more Americans were needed to secure Baghdad and that the Iraqi forces were not ready to take over. The general bucked his superiors, particularly then-Defense Secretary Donald Rumsfeld, who did not want to send more troops. "He pushed for more American troops," says Keane, "and for a time those troops were not accepted." Not accepted, at least, until Rumsfeld was replaced. But Gentile argues that reduced violence had less to do with improved security than the cease-fire ordered by anti-American cleric Muqtada al-Sadr and an effort known as the Sons of Iraq — a group of 100,000 one-time Sunni insurgents paid by the Americans to keep the peace. 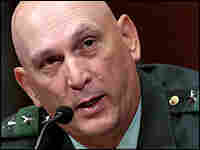 Odierno was among those who pushed for the Sons of Iraq program. But Cole and others note that the Iraqi government of Prime Minister Nouri al-Maliki is not ready to fully accept the Sons of Iraq. "Of course the Americans are still picking up the tab for this," Cole says. "It's not clear to what extent Maliki is committed to this." Some officers tell NPR that Odierno pressed for a more aggressive stance against Sadr's Mahdi Army than Petraeus was willing to accept, and Odierno balked at releasing large numbers of Iraqi detainees no longer deemed to be a threat to the Americans. Petraeus believed that the detainee release program would ease the insurgency. Anderson, Odierno's former chief of staff, supports his old boss's concerns about that release program, which is ongoing. "We clearly put the brakes on the numbers, because they were trying to have these massive releases that were not going to be properly screened," recalls Anderson. "Nor could we properly support getting these folks to where they had to get." As Odierno prepares to take Petraeus' place, there is some skepticism about the road ahead. Sen. Jim Webb, a Virginia Democrat, told the general the goal of helping to build an Iraqi state is more political than military. Webb asked what would happen to the number of U.S. troops once the political goals were met. Odierno said the number of forces would "adjust over time." Webb pressed the general: Does he think a stable Iraqi state needs any U.S. forces? "I do not," Odierno replied. "I believe what we would want is to maintain military contacts, as we do with many countries around the world, over time." Left unsaid was when more than 140,000 troops can transition into military contacts.